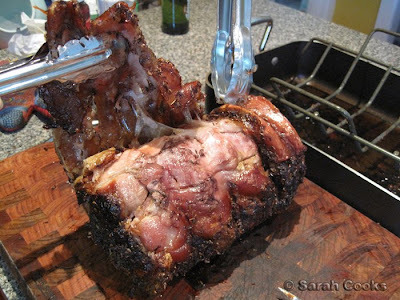 Ooh... check out that slow-roasted shoulder of pork. So juicy, so tender, so melty! And we haven't even got up to the crackling yet. I know, I know, after Christmas we're all supposed to be restraining ourselves and re-starting our detoxes, joining the gym and whatnot. And yes, I promise I'll try to try... but last weekend my cousin and her family moved to Australia and I just had to make a meal to officially welcome them! I love cooking for my cousin's family, especially for her kids, the impossibly cute Cheryl and Darren. They are adventurous, have big appetites, and always seem to like what I cook. We'll start with the dessert, as I made it the night before. The dessert was a combination of 2 things I've made before - Nigella's fabulous cheesecake ice-cream, and Joanna Weinberg's deconstructed cheesecake. 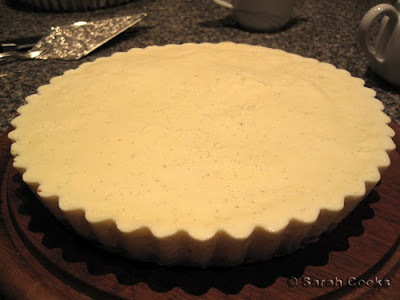 I remembered that my niece liked the cheesecake ice-cream, and I wanted to add my beloved cheesecake crust. 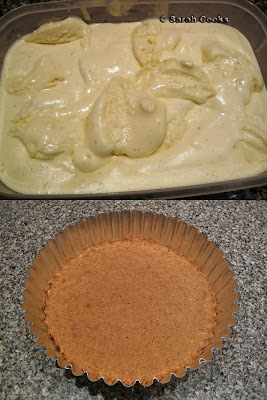 Rather than folding crumbs through the smooth cream, I thought it would look nicer to arrange it as a frozen pie - spreading the semi-frozen ice-cream over the crumb base and leaving the whole lot in the freezer overnight. 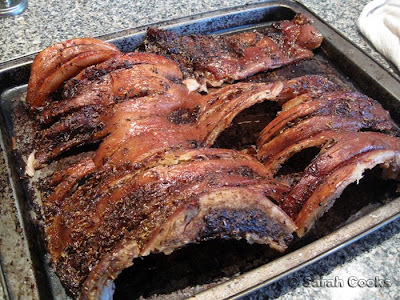 For the pork, I kinda combined Nigella's 24-hour roast pork with Jamie Oliver's slow-roasted pork shoulder - Nigella suggest a 9.5kg shoulder for 12 people (AHEM! ), whereas Jamie suggests a 2kg shoulder for 6. The day before our dinner, I went to the always-fabulous Rendinas butcher to pick up a pork shoulder. They only had frozen ones, and they sell them boned and rolled. The biggest one they had was about 2.5 kg. Even though they said it would be enough for 10 people, I kinda panicked that it wouldn't be enough, and I bought another, 2kg shoulder at the same time. The total came up to $150!! I nearly fainted. However, this translated to approx $33/kg, and makes sense, given that it was biodynamic, free-range, rare-breed pig - grown with love. Wessex Saddleback, if you're interested. How Nigella expects a mere mortal to buy 9.5kg of pork shoulder is beyond me, and it seems reckless and wasteful to suggest such a huge amount of meat for only 12 people. When I got home and looked at the 2 shoulders, they suddenly looked a lot bigger than they did at the butcher, so I wrapped up the smaller one and stashed it in the freezer, and left the larger one out on the bench to defrost. 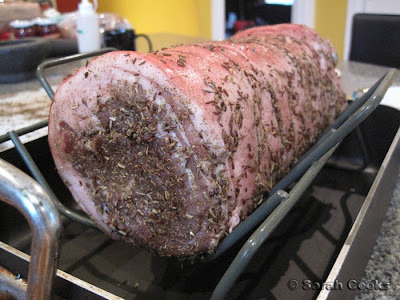 On Sunday morning, I got up at the crack of dawn, patted the pork dry with a kitchen towel, and covered it in a mixture of salt, fennel seeds, caraway and marjoram. You start off by blasting it in a super-hot oven for 30 minutes, then turn it down to 120C and leave it for 12 hours. 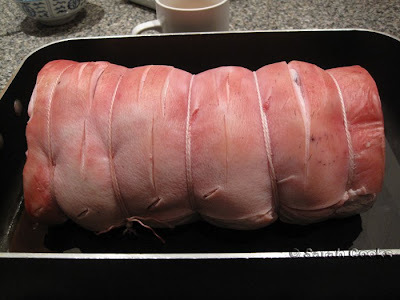 Yes, the whole house smelled like roast pork, all day! Check out all the fat that melted off..
After the long, slow cooking, we peeled off the fat, wrapped the meat in foil and allowed it to rest. I laid the skin out on an oven tray, and put it back in the oven at maximum heat to crisp up. After about 25 minutes, the crackling had bubbled up and become crisp. It was easily shattered with a wooden spoon. The meat was incredibly tender, and it only took a few gentle prods with a fork to break it apart into the glorious pile you see below. 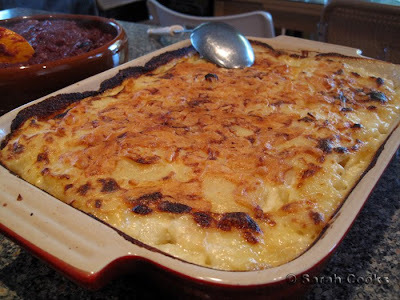 ...and potato gratin (Nigella Bites). 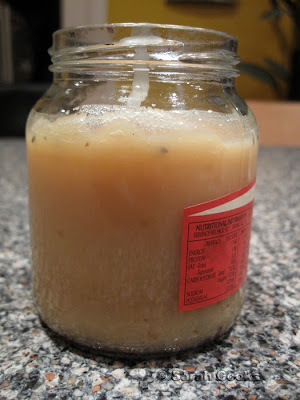 I also made a quick apple sauce with some granny smiths we had in the fridge, and an onion-cider gravy. 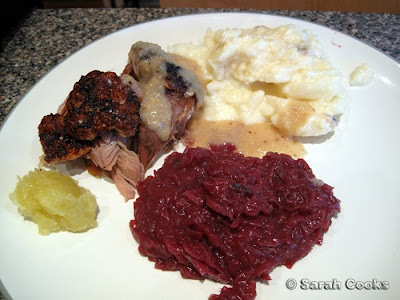 (This was exactly the same gravy we had with our Christmas turkey, but using dry cider instead of Marsala. It ended up being a bizarre beige colour, but tasted good nonetheless). One (modest) plate. Believe me, seconds were had! 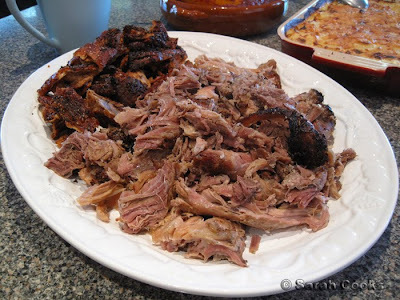 I was really pleased with the meal overall, and love the easy method for cooking pork. It was so incredibly juicy and tender! My cousins liked it too - big salty crackly smiles all around. I've come to realise that this slow roasted pork is very similar to Italian porchetta, and American pulled pork, both of which I am keen to try now. 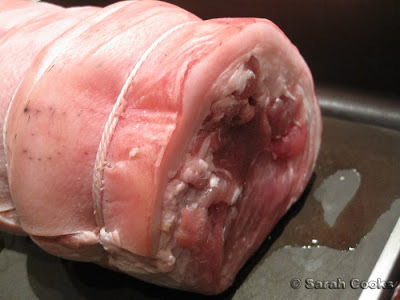 (And seeing as I have a prepared pork shoulder stashed in the freezer, I'll be able to do so very soon, heheheh). We got through about three quarters of the meat (a mammoth effort, even by a Malaysian family's standards), and the leftovers have been used in the most divine sandwiches I've ever eaten. A short while after dinner, we were prepared to tackle dessert. The cheesecake ice-cream is always soft and easily scoopable, even straight out of the freezer, so I only let it sit out for a minute before slicing into it. I served it with hot raspberry sauce - I just whizzed up some frozen raspberries in a blender with sugar and a squeeze of lemon, and heated it over the stove. I absolutely loved this pie! 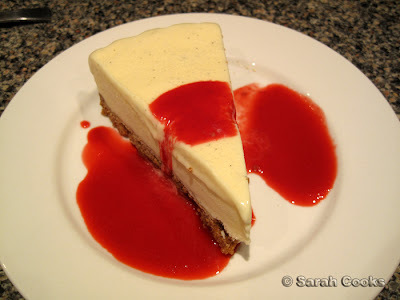 Perhaps even better than normal cheesecake. The contrast between crunchy base, smooth and cold filling, and hot sharp raspberry sauce was fantastic! It filled a whole red cabbage jar!! ARGH! Oh well, at least this is a jar of fat that didn't end up in our stomachs. Yay! omg that pork looks amazing, and for a minute i thought you were bottling that fat to use! 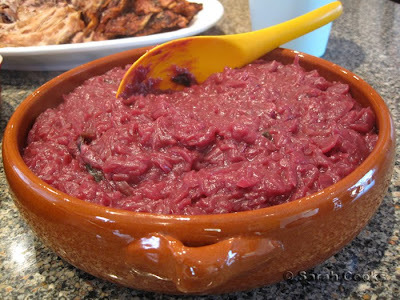 However, is it odd that all I really want to do is run off with that entire bowl of red cabbage? Looks soooo good! Oh wow, that pork looks divine! 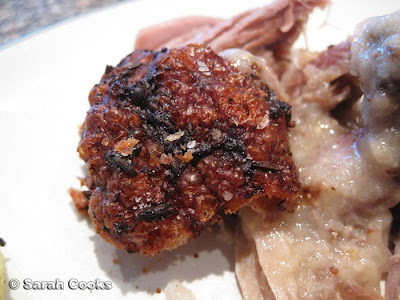 My mouth is just watering thinking of the soft, melt in your mouth meat and the crunchy crackling! YUM! Ohmygod! 9.5kg of pork for 12 people? Either Nigella has a huge appetite or she is crazy! Your pork shoulder looks and sounds amazing. I think I would have fainted from the cost too, but I'm sure it was completely worth it. Hannah - I also *love* red cabbage! I always make it with any roast dinner, and often for midweek meals too. 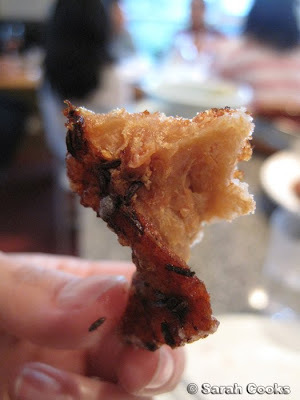 April & Norm - Haha, my family were joking that the crackling was "fat free" because all the other fat had drained off! Wow, I am astonished at the cost of the meat. I have just purchased a whole organic shoulder, hock and all. I watched as the butcher cut it from the fresh carcass, a beautiful piece of neat, about 9 kilos. It cost me £31. But it looks like you did a tremendous job on your pork. 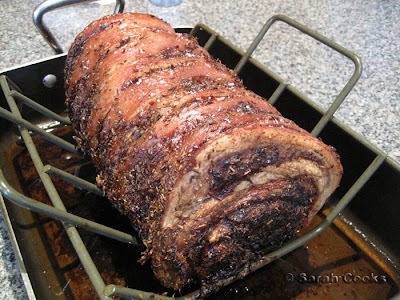 It looks absolutely delicious, with ace crackling. I am doing a 24 hour job on mine at the weekend and I hope it turns out as good as yours did. Hi, I am about 13 hours through the 24 hours cooking time and my 8.5kg leg (on the bone) looks and smells amazing. I am concerned that another 11 hours will be too much though as it is already quite dark on the outside. The joint is full encased in a thick layer of skin and fat so is pretty well protected. I have been roasting at 120C in a fan oven uncovered, should it have been covered or in a non-fan oven? Mini - I hope you enjoyed the pork! Love this recipe. Steve - Unfortunately I haven't tried doing a 8-9kg bone-in pork for 24 hours, so I wouldn't be able to give advice about cooking it, sorry! :( I always do smaller pieces with no bones, and they take about 12 hours. But at such a low heat and with so much fat/connective tissue in the shoulder, the low-slow cooking will surely make you shoulder tender. I hope it turns out well!! Hi, we went for the full 24 hours, I reduced the fan oven heat to 100C after 13 hours and it remained uncovered for the full time. All our 25 guests were over the moon with it but I would have said although it was delicious it was a little dry and could have been better if only cooked for 12 hours. World class flavour and crackling though! Hi Steve. How many kg of pork did you use for 25 people? Steve - Glad it went well! 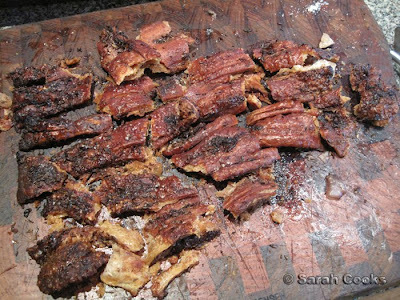 I bet your crackling was amazing! Elizabeth - Hehe, thanks so much! thanks so much for the tip to combine the 2 recipes. 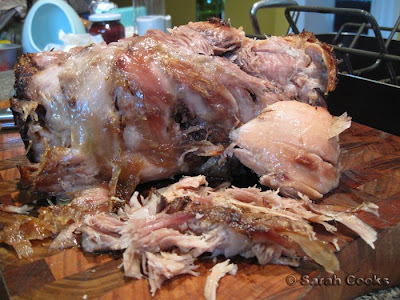 i have been fretting about that massive pork shoulder of Nigella's and your comments about quantities are really helpful!